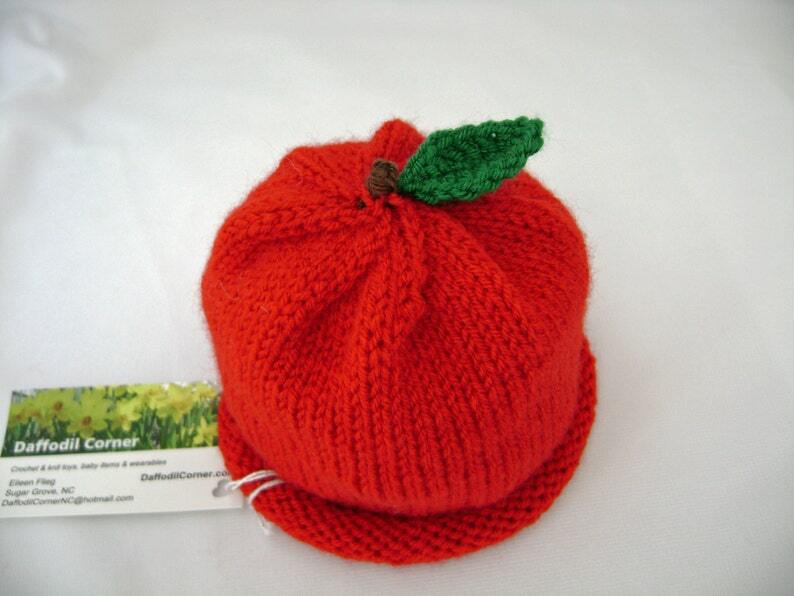 Just like a crisp Fall apple, this handknit baby hat is bright red, with a brown stem and green leaf. It's soft, warm and washable! Your little one will look adorable wearing this while keeping his or her head nice and warm. It makes a great baby shower or newborn baby gift. I knit this hat on circular needles, using very soft sport weight yarns of 100% acrylic, so there is no seam to irritate baby’s head. The hat has a rolled brim and is stretchy. Babies’ head sizes do vary greatly, so if in doubt, measure the circumference of the baby’s head. Please allow 7 to 10 days from purchase for me to create your hat. Handknit by me in a smoke free, dog loving home. Shipping: The hat will be shipped via USPS First Class Mail with delivery confirmation to US customers. International customers will receive their hat via USPS International First Class Mail (delivery confirmation where available). Please see the shipping tab for shipping costs. Any duties or customs fees are the responsibility of the purchaser. I combine shipping to get you the best rate for multiple items purchased at the same time.